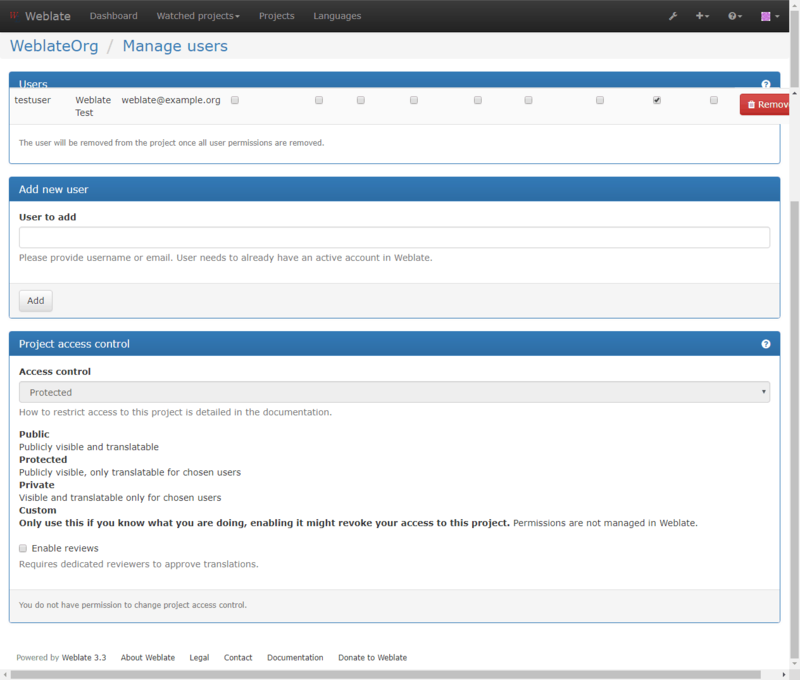 Weblate can be configured to support several translation workflows. This document is not a complete listing of ways to configure Weblate, there are certainly more options. You can base another workflows on the most usual examples listed here. The Access control is not much discussed in the workflows as each of access control options can be applied to any workflows. Please consult that documentation for information how to manage access to translations. In following chapters, any user means any user who has access to the translation. It can be any authenticated user if project is public or user having Translate permission on the project. Translation is empty, it might or not be stored in the file, depending on the file format. Translation needs editing, this is usually result of source string change. The translation is stored in the file, depending on the file format it might be marked as needing edit (eg. fuzzy flag). Translation is done, but not reviewed. It is stored in the file as a valid translation. Translation has been approved in the review. It can no longer be changed by translators, but only by reviewers. Translators can only add suggestions to it. Suggestions are stored in Weblate only and not in the translation file. This is most usual setup for smaller teams - anybody can directly translate. This is also default setup in Weblate. Any user can edit translations. Suggestions are optional way to suggest changes, when translators are not sure about the change. With this workflow, anybody can add suggestions, however they need approval from additional member before it is accepted as a translation. New in version 2.18: The proper review workflow is supported since Weblate 2.18. With dedicated reviewers you have two groups of users - one which can submit translations and one which reviews them. Review is there to ensure the translations are consistent and in a good quality. Any user can edit non approved translations. Reviewer can approve / unapproved strings. Reviewer can edit all translations (including approved ones). Suggestions are now also way to suggest changes for approved strings. Depending on Weblate configuration, the setting might not be available to you. For example on Hosted Weblate this is not available for projects hosted for free.